In Florence, on October 29, 2015 the spectacular Museum of the Opera del Duomo, where the largest collection of Florentine medieval and renaissance sacred sculptures in the world is preserved, opened after a two year major restoration. 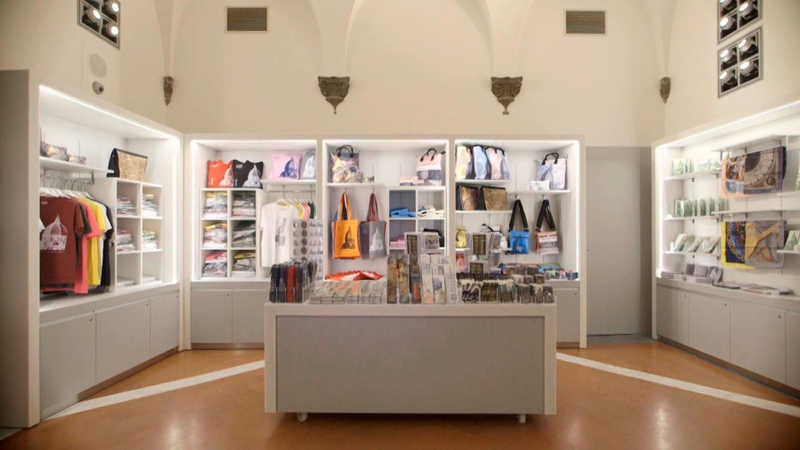 Preparing for a planned papal visit to Florence in early November, the “new” museum stresses the close connection between art and faith. The Museo dell’Opera Del Duomo (Museum of Cathedral Works) is directly behind the cathedral at Piazza del Duomo 9 and still occupies the site at the east end of the Piazza del Duomo, where in 1432, four years before the completion of the great dome that he designed for the cathedral, Filippo Brunelleschi was entrusted with the construction of its headquarters. A primary legacy of the Opera’s long history is its unparalleled collection of medieval and Renaissance Florentine sculpture, consisting of about 750 statues and reliefs, including pieces by all the greats — among them, Arnolfo di Cambio, (who was also one of the architects of the Duomo) Andrea Pisano, Donatello, Lorenzo Ghiberti, Andrea del Verrocchio, Luca della Robbia and Michelangelo. 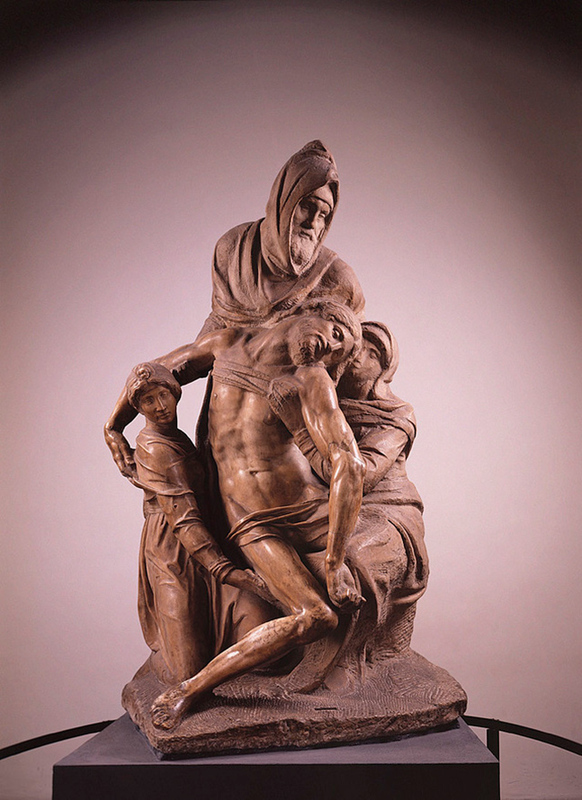 The best-known work, of course, being Michelangelo’s La Pietà, a work he sculpted when he was almost 80 and intended for his own tomb. Due to space constraints, however, the Opera has never been able fully to display its riches. In 1891 a two-room Opera museum opened, which gradually expanded during the 20th century, but its premises remained modest in comparison with the city’s other major museums. The ambitious new design was made possible by the purchase in 1998 of the former Teatro Degli Intrepidi, which since 1914 had been a cavernous warehouse and then a parking garage. That space has now been dramatically transformed by the opening of the new museum at the end of October. The €50 million project, almost entirely financed by the Opera itself, with some contributions from private donors, has involved taking over neighboring buildings, including an 18th-century playhouse, to create nearly 6,000 square meters of exhibition space. 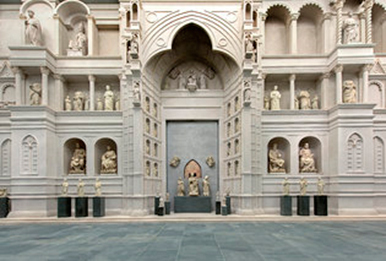 The centerpiece is a vast top-lit hall containing an actual-size reconstruction of the original medieval facade of the Duomo, designed by Arnolfo di Cambio in the late 13th century. said Monsignor Timothy Verdon, the art historian who was the mastermind behind the renovation. Over seven hundred years after its foundation, this “new “and hugely impressive Museo dell’Opera del Duomo is still actively engaged in preserving and enhancing the sacred and liturgical treasures comprising the Great Museum of the Duomo, which includes the Cathedral of Florence, Brunelleschi’s Dome and the crypt of Santa Reparata, the Baptistry of San Giovanni, Giotto’s bell tower and the Historical Museum. And, now it is a world class museum on its own. An equally stunning art shop is part of the museum. An extensive collection of high quality products, crafted by ROSSI 1931 with the designs and the colors of the official and exclusive graphics of the Grand Cathedral Museum are proudly featured in the Museum Shop; writing paper and cards, pencils, notepads, bookmarkers, notebooks and accessories. Donatello’s Choir Loft and a detail.